On the corner of Pasteur-Điện Biên Phủ Road, Sài Gòn, there is a flower tree completely different from the other trees around it. When October comes, the scent of the flower spreads all across the street. For years now, a woman whose hair is now white has been seen around there since she was still young. When the tree was small, she watered it and cared for it. When the tree was in full bloom, she came to look at it and often brought some branches home. She calls it the milk flower tree. In the mid-Autumn Festival this year, she was seen going together with a young girl to see the milk flower tree. The girl bore some features of a Western girl, with a high nose and white skin, but her eyes and hair were as black as those of the Vietnamese. She spoke fluent Vietnamese. Different from the other years when she came and watched in silence the flowers on the tree, she was smiling and looking at the girl with love in her eye. She slowly answered the girl’s repeated questions. At the head of the alley, near the corner of Pasteur-Điện Biên Phủ Road, there is a lovely villa with a trellis of antigone flowers which bloom pink all year round. The house owner was a doctor in charge of the surgery department of Chợ Rẫy Hospital. He studied medicine in France. He had a beautiful daughter who was ready to help anyone in need. In the Spring of MậuThân Lunar year in 1968, Sài Gòn was quiet, indescribably tranquil, with Tết days around the corner, even though markets were in hustle and bustle, bars and pubs and dance halls were filled to capacity with the American GIs and Sài Gòn soldiers. Fire crackers were allowed to be set off on the eve of the Lunar New Year. The whole of Sài Gòn seemed ready to explode amid the fire crackers welcoming the New Year. Out of the blue, gunfire was heard all over the streets in central Sài Gòn, in the key offices of the Sài Gòn administration like Tân Airport, the Police General Office, the Sài Gòn Radio Station, the US Embassy, the Independence Palace and so on. A Lunar New Year’s Eve night had shocked the US and the world, sent horror to the American GIs fighting in Việt Nam. That the US Embassy, previously thought to be impregnable, was occupied by Việt Cộng (Vietnamese communists) stunned the White House and the world. The fighting got even fiercer in the later days of Tết. A see-saw battle happened in every street. Eventually, the liberation fighters were unable to hold the occupied positions due to late reinforcements. Many units of the Liberation Army had to split into smaller units and they lost communications in Sài Gòn. At the corner of Pasteur-Điện Biên Phủ Road, there was usually a small post guarded by a squad of the Sài Gòn army; yet, on the night of the Lunar New Year, it was heavily guarded by a company of hundreds of soldiers with the support of three armoured cars to block the road. A Liberation Army unit had launched an assault onto this post in an attempt to open this road so that the liberation fighters could be able to advance deeper into the centre of Sài Gòn to reinforce the fighters at the US Embassy, the Independence Palace, the Radio Station and other areas. All the houses around were shut. The doctor’s villa was also closed. But it was noisy inside. They had a guest, a special guest at that: It was a Việt Cộng fighter. He was unconscious with blood smeared all over his body. Immediately after hearing the gunfire at the crossroad near their house, the father and daughter had followed the fighting on the terrace. During the night, they had seen three liberation fighters fighting against the powerful firepower of the Sài Gòn army. In the end, two of them had died and the third was heavily wounded. They saw him crawling slowly into a bush at the back door of their house. Without delay, the father and daughter went downstairs and opened the back door. 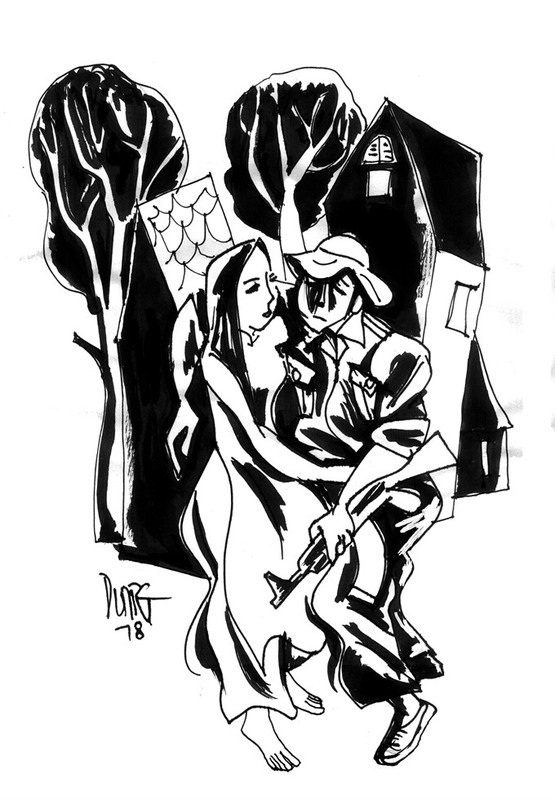 The girl helped the Việt Cộng soldier into the house, while the father tried to erase all traces of him. Then, a field operation room was quickly set up in the bunker inside the kitchen, which had already existed when he bought the villa. The doctor raced with time to save the Việt Cộng man, while his daughter was in the house in case the Sài Gòn troops came to question them about the missing Việt Cộng. Five days had gone by without having found the Việt Cộng fighter, the Sài Gòn soldiers had guarded everywhere and searched everyone passing by, as they believed that this Việt Cộng could not have escaped. They were in great doubt about the house of the doctor, but he was a famous man who had saved a lot of lives in the city, even the lives of Sài Gòn soldiers’ relatives. So they felt hesitant. “Oh, my word, you’re conscious” – the girl’s voice was as smooth as silk. “What tree will die?” – The girl asked, running to the corner of the room to fetch the knapsack. She saw some green leaves cropping out of it. She took it out and found that it had been wrapped in a bag. She gave it to him. The girl smiled, looking far away as if she was wishing to be in Hà Nội together with him. Suddenly, she blushed. The stories he had told made her feel ever closer to Hà Nội. Twenty days had gone by. The wound had healed and the Việt Cộng man recovered. After he told her how to contact his liaison, the girl contacted his men who came to take him back to the rear. Only half a day left before he had to say good-bye to the girl. The young people felt greatly for each other during these days. They sat by their sides in silence. He took her hands, looking deep into her eyes. They exchanged looks as if they wanted to keep the image in their head forever. And as if unable to stand the moment, they kissed each other. Time seemed to stay still. On April 30, 1975, Sài Gòn was liberated. The girl became the doctor of a military unit. After the Việt Cộng soldier had left the house of the doctor for some time, the girl also left for the revolutionary resistance area. The house now had a six-year-old boy. His father was not there. His name was Long Hà. One day, the girl transplanted the milk flower tree in the corner of Pasteur-Điện Biên Phủ Road where that wounded Việt Cộng soldier had lain the other year. She watered it every day; she cared for it with great concern. When she was asked about the tree, she answered that it was the milk flower tree of a liberation soldier from Hà Nội. When the first flowers were in bloom, she picked one branch of flowers and put it on the altar where beside the photos of her father and mother, there was a photo of the soldier.